Artisanal used to mean tradition. The word evoked a return to locality, and images of craftsmen who slaved over their produce because their passion was the simple reason for hard work. No interference by machines and big conglomerates permitted, period. 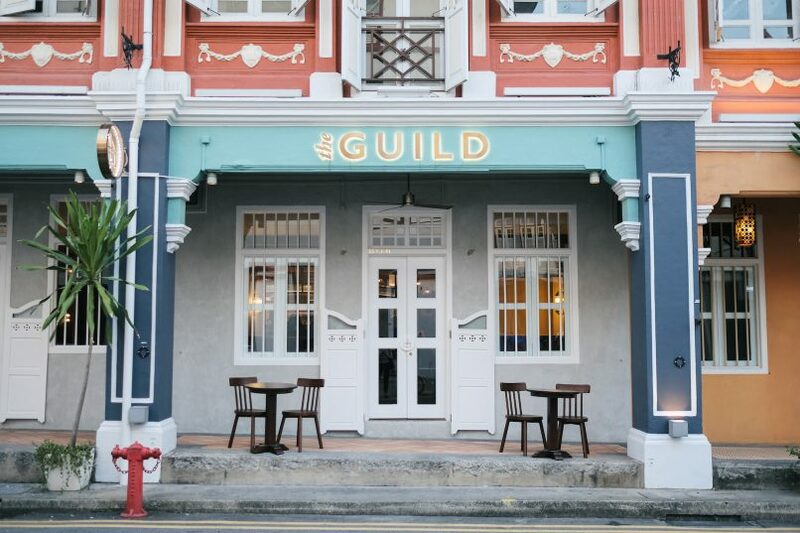 That romantic notion has mutated into a marketing ploy, a reality that The Guild, a new restaurant-bar along Keong Saik Road stands against. As a collaboration between Hong Kong’s multi-award-winning Young Master Brewery and acclaimed chef Vincent ‘Vinny’ Lauria, The Guild takes the idea of “artisanal” and “craft” back to its roots by curating an extensive food and drink programme where small-batch distillers, brewers and wine-makers take centre stage. The Guild is strict when it comes to sourcing for the beverages that find a home on behind the bar. All the craft beers, natural wines, and spirits are purchased from independent producers, in the truest sense, because none of the labels found on its sprawling menu has sold out to a large company. There’s no pretension when it comes to that approach, however, as The Guild is doubly determined to make its alcoholic wares accessible — i.e. you don’t have to be a craft nut to enjoy what it has to offer. The shophouse The Guild is situated in used to be home to Singapore’s pioneering secret bar, The Library, and its sister eatery, The Study. 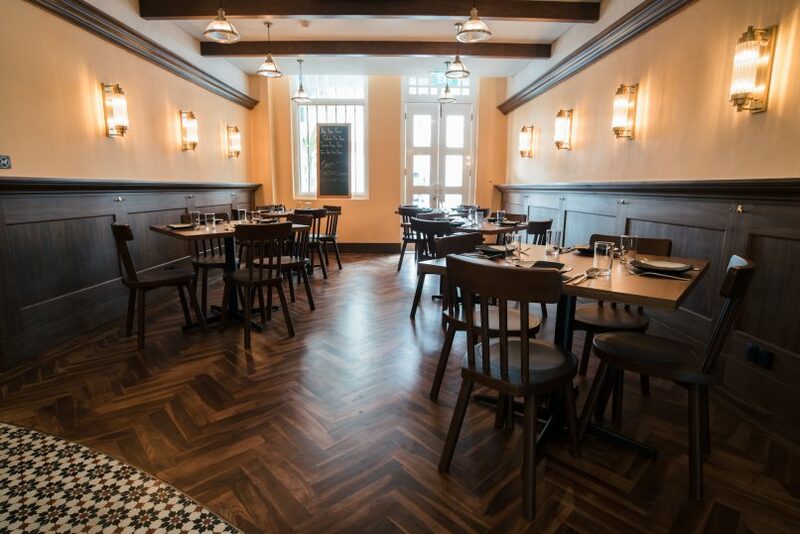 Redesigned by Hong Kong firm, Officina, The Guild pairs Peranakan elements with dark wood furnishings, making the space look like a contemporary take on an old-school salon. Dim lights and intimate clusters of tables add to the comfortable atmosphere The Guild guns to create. This is the kind of place you’d see yourself hanging out with your friends on a weekend evening. Step into The Guild, and your eye immediately goes to its circular bar. 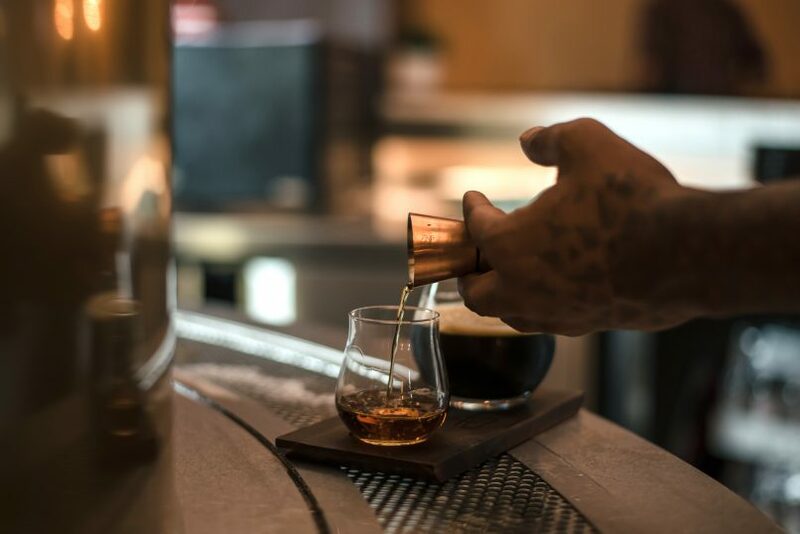 At the heart of the commanding edifice are 19 taps that pour a range of Young Master Brewery and other craft beers, as well as one gin and tonic. All the beers arrive in Singapore cold chained, chilled throughout the journey to ensure maximum quality. Start off your evening with one of the lighter beers and move your way up to its headier goods. The Cha Chaan Teng Gose makes a refreshing introduction to the Young Master range. As the brewery’s interpretation of soda and salted lime, a Hong Kong teahouse staple, the sour beer has a zesty, mineral kick that makes it supremely chug-worthy. Even the beer taps are detailed with Peranakan tiles. Fake Juice, another Young Master star, is a New England IPA that tastes like grapefruit juice for grown-ups. The amber liquid has a mellow bitterness from the hops that doesn’t compete with the beer’s juiciness, making this another winning session beer. 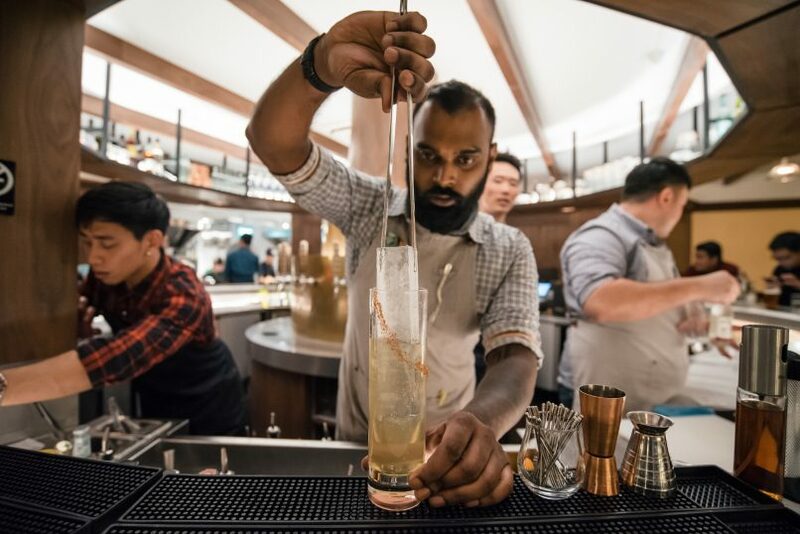 The Guildhouse G&T is a novel addition to the draught line-up, made on-site by bartender Yadhaven Santheran. The former Andaz and The Summerhouse cocktail whiz uses the citrus-forward Lairos gin from Spain, cut with J. Gasco’s bitter Indian tonic. The two play off each other to create a dry thirst-quencher, bright with notes of preserved orange peel. Post-beer, dive into spirits by starting with the highballs. Try Los Cojones, a tropical mix of Abuelo Añejo, Caribbean pineapple liqueur, lime and ginger beer that finishes with a spicy tickle. Be brave and try the Umami Gibson. Touted as one of The Guild’s “funky” cocktails, the martini classic is rebuilt with tomato gin, shiitake-infused white vermouth and pickled mushroom brine. Salty, earthy, and definitely umami, this savoury beast tackles your taste buds and lingers even after the glass is empty. 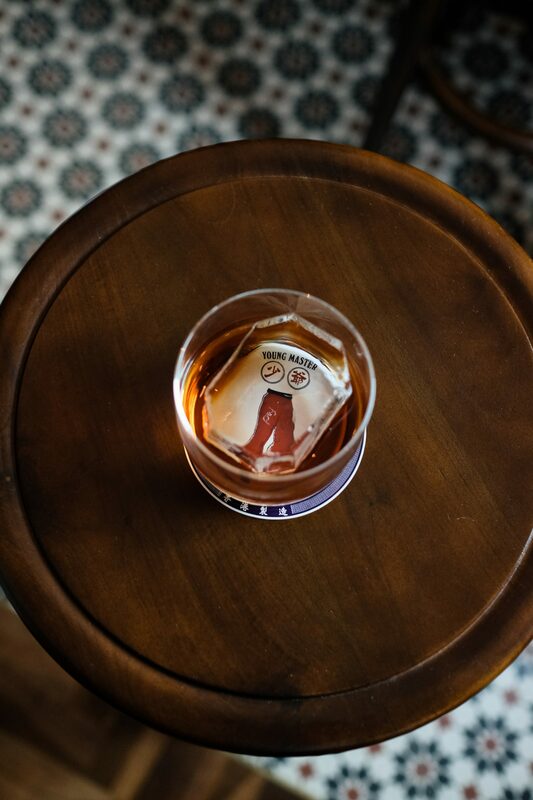 Cap the night with a boilermaker. Of the four on the menu, we had the Brewers Penicillin, where a tasting portion of the Cha Chaan Teng Gose is served alongside a shot of Laphroaig 10. Don’t do like an American frat boy and dump the shot into the beer. Eschew collegiate traditions and sip both side-by-side to really enjoy how the smoky whisky and saline gose complement each other. The small-batch ethos extends to Chef Lauria’s culinary agenda. The menu is packed with his renditions of familiar comfort food, made with locally-sourced ingredients where possible. Some of these ingredients even surprised us seasoned Singaporeans. The fresh oysters from Pulau Ubin’s Sea Farmers were a briny contender that could stand up to the same shellfish from major producers. It can be ordered fresh, or deep-fried, topped with hollandaise and homemade chilli jam — Lauria’s take on local orh lua. The chef’s Italian-American identity pervades a bulk of the dishes on the menu, and because of Lauria’s familiarity with the Asian palate, having been a chef in Hong Kong for just shy of a decade, the influences from his own culture merge respectfully with ingredients familiar to us. Frogs from a Jurong farm appear in two dishes. General Tso’s frog legs, a springy reinvention of the Panda Express signature, would impress even your staunch Chinese grandmother, and that is a claim we don’t make lightly. Hashima, more commonly known as xue ha, is used in place of bone marrow in Lauria’s marrow bruschetta. Hashima is not naturally flavourful when compared to bone marrow, but when served alongside a pulled oxtail marmalade and pickled onion salad, the fatty chunks provide an intriguing textural contrast. 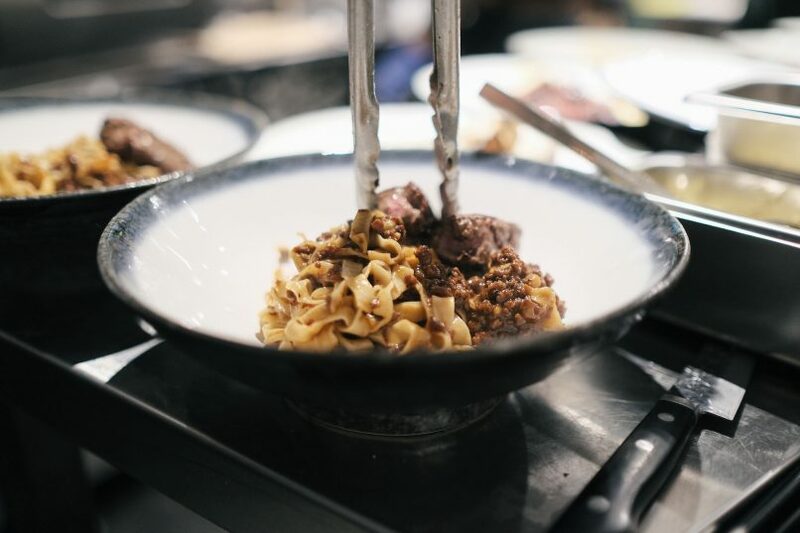 BOLO, or bak chor mee tagliatelle, is another one of Lauria’s Italian-American-Singaporean hybrids. 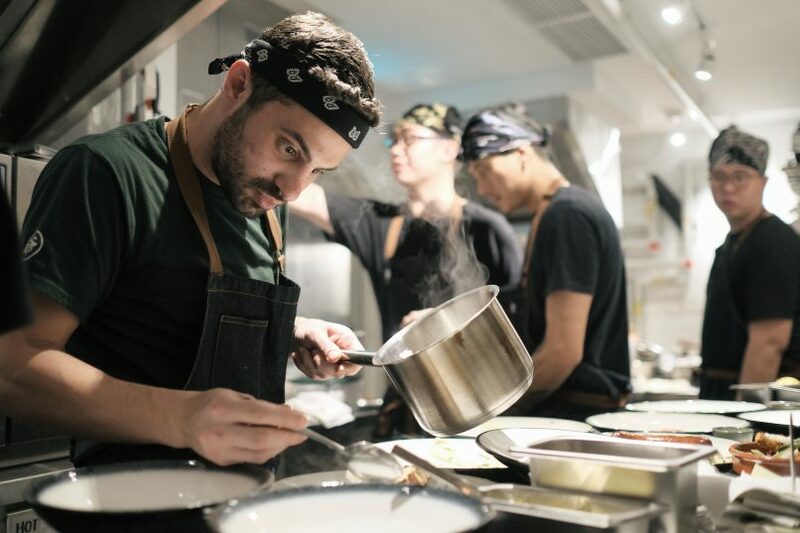 Lauria is also determined that his kitchen creates from scratch as much as possible, and that includes smoking their own tribute to char siew pork. Dubbed grilled sweet and spicy bacon, these thick cuts of meat are cured for two weeks, then smoked with lychee. The caramelised slices come to your table scored with char marks that say two things: That the meat spent quality time on the grill, as it should, and that the chef isn’t shy with edible statements that prove burnt bits are sometimes the best bits. The chef’s intention to create food-for-the-heart truly shines when he returns to his upbringing for inspiration. 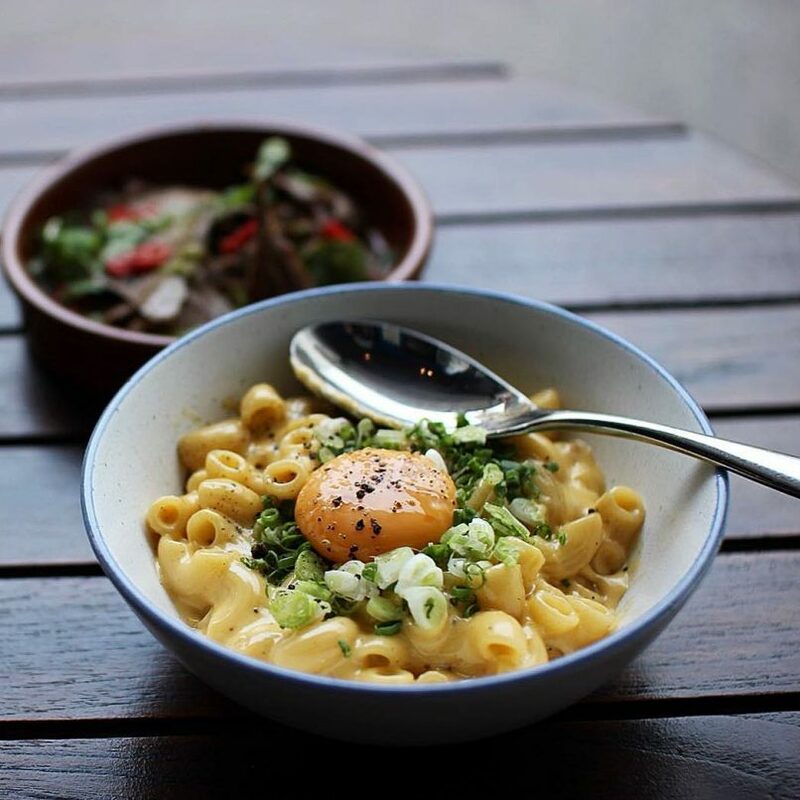 The mac n’ cheese is an old family recipe, made with a sharp cheddar sauce that is taken to creamy heaven by a secret ingredient that we’d be brained if we reveal. It may be a homely, simple dish you can make on your own, but Lauria’s version is so worth leaving the house for. 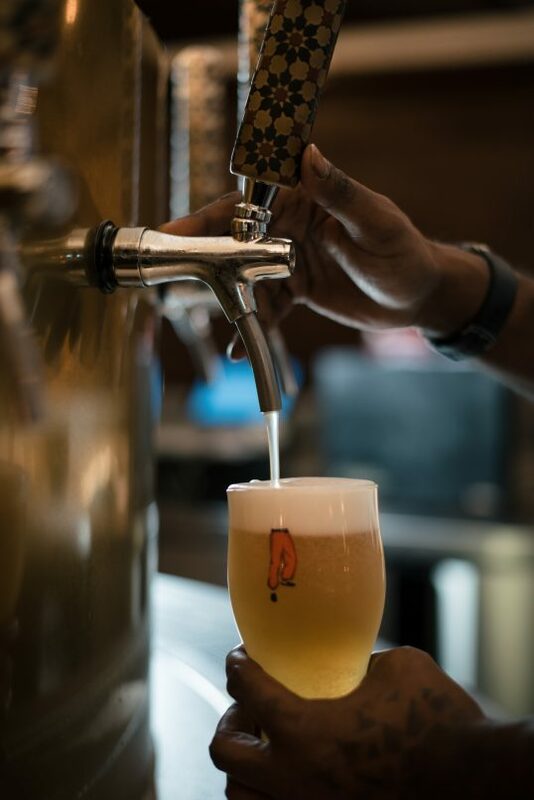 With soulful food designed to pair with a dizzying array of small-batch brews, The Guild makes a strong case for being the gatekeepers of the craft produce movement in Singapore. Service: Highly attentive, even when the restaurant is hit by the dinner crowd. Our water glass was filled every time we blinked, which is the truest measure of prompt service, in our opinion.